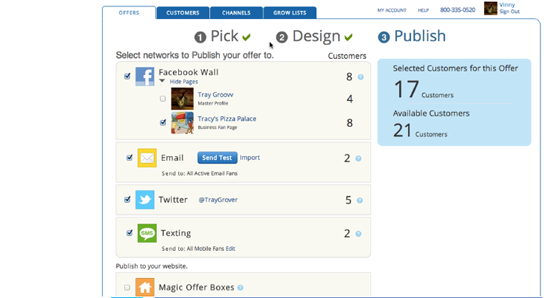 Send offers to your customers via Facebook, Twitter, SMS Text or online to help grow your business. Accept credit card payments at the counter, on the floor or on the go. Wherever you may be, accepting payments has never been so quick, easy and affordable. Ready To Get In The Groovv? Groovv Register replaces traditional cash registers and credit card terminals to help you make more sales efficiently. Base hardware package includes tablet, swivel stand, receipt printer, credit card reader and heavy duty cash drawer all included at no charge with your low rate merchant account. A second optional tablet and card reader is also available for retail environments. Now you can easily access key information, so you can grow and manage your business better than ever. 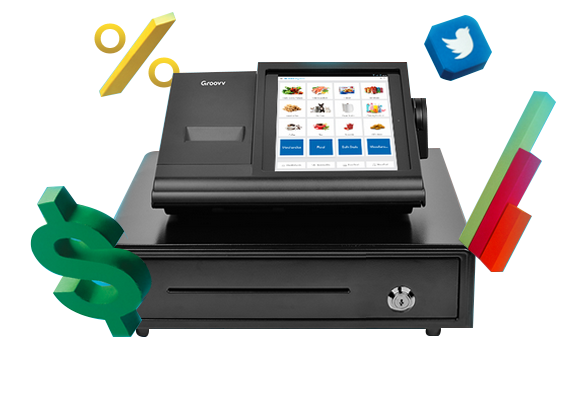 Groovv’s powerfully simple point of sale and mobile & social marketing solutions can help all kinds of quick or table service restaurants make more sales easily. Now you can quickly identify your most valuable customers and your most profitable items, and create targeted promotions that increase customer loyalty and revenue. Being successful in retail takes more than stocking great products. You have to deliver a great customer experience, and promote yourself effectively in order to bring in new customers. Groovv’s powerfully simple point of sale, marketing and integrated payment solutions make it simple for you to manage and market your store. No purchase, no lease and no down payment means no up front expense. 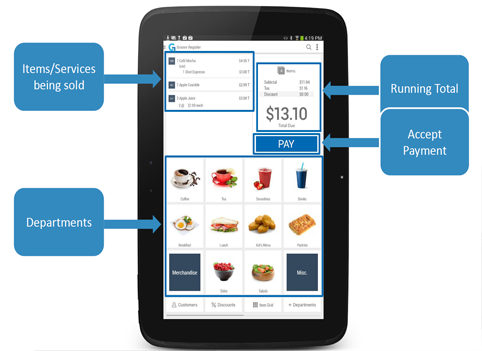 And with a low monthly support fee Groovv makes point of sale affordable to any small business. 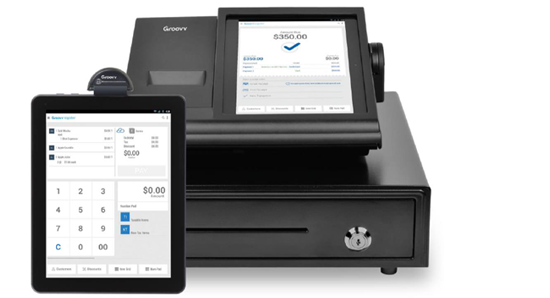 Included with every Groovv tablet POS system is a built-in mobile and social marketing platform. 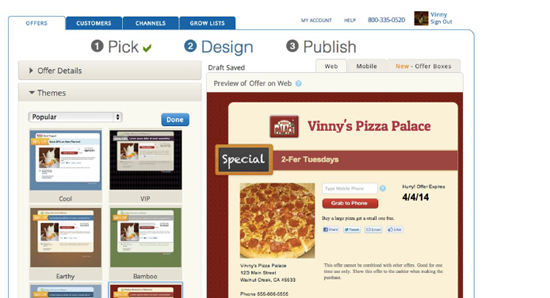 Groovv Offers’ web-based interface takes the guesswork out of marketing. Manage all your promotions from a single web-based tool anytime, anywhere. Increase traffic and drive repeat sales. Get customer sign-up tools and in-store signage to grow your list. Create specials, coupons, sales and more using a gallery of hundreds of headlines, offer types and stunning themes. 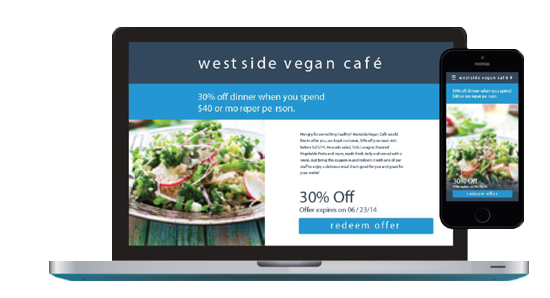 Generate branded online and mobile pages for each offer. Customize your offers with your own branding, logo and photos. Easily collect customer information to grow your list. Manage up to 20,000 email addresses and 1,500 phone numbers. Send an unlimited number of offers each month to your customers on Facebook, Twitter, email, text message and even your own website – all with a single click. Redeeming an offer is as simple as pressing a button or entering a six-digit number. 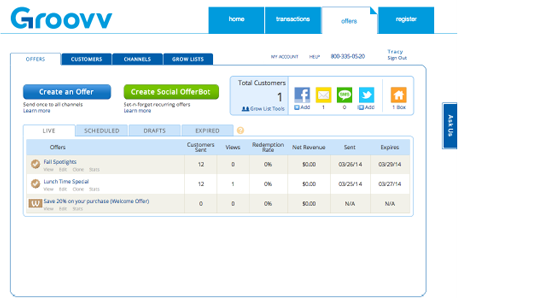 Set a Social Offerbot to automatically send offers to Facebook and Twitter. 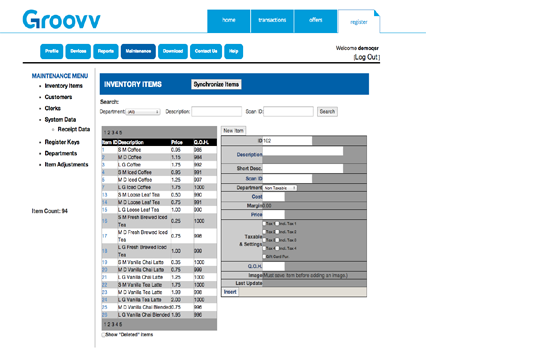 Sales and redemptions are automatically tracked and viewable online in real time. Lean on our Marketing Coaches for marketing ideas. We’re more than just tech support. We’re total business support. Contact us day or night for exceptional customer service, live technical support or friendly marketing advice. No need to worry about budgeting for your next POS system. 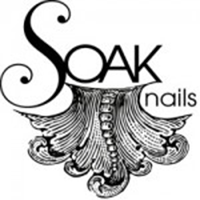 If your Groovv Register POS system breaks we’ll replace it for free. Rates as low as .25% for swiped transactions and a low rate guarantee for existing businesses. Month to month. No long term commitment. Accept credit card payments at the counter, on the floor or on the go. Add multiple users with unique logins to review your employees’ performance levels. Groovv Register is easy to setup and learn. Optional on-site installation is available for a small fee if you’d rather have a little extra one-on-one assistance and training. Sign up for a Groovv Register POS system in minutes. Equipment is delivered in 3 – 5 business days. No lengthy paperwork to sign and no long term commitment. Cancel at anytime with no penalty.